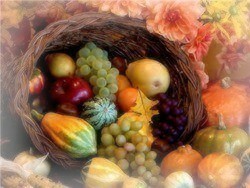 The cornucopia is traced back to the ancient Greeks and Romans. It comes from Greek mythology and was said to be a “horn of plenty” that was given by the Greek god Zeus. The horn was believed to magically produce an endless supply of anything desired by the one who owns the horn. Lamas Day, was celebrated in the British Isles. On this day people would take a loaf of bread to church. The loaf was baked from the first harvest. Harvest Festival is celebrated in the UK and as time goes on many of the American traditions and foods are added to celebration dinners. Victory and Homeland Thanksgiving Day is celebrated in Croatia on August 5th. But rather than a thanksgiving holiday it is really a memorial to the day that the city of Knin was seized by the Croatian Army during the War of Independence. Let us not only be thankful one day a year but celebrate the greatness of our God with thanks everyday! This collection of Thanksgiving Bible Verses focus on reasons to praise our great God. Featured Thanksgiving Verse: Hebrews 12:28-29 Therefore, since we receive a kingdom which cannot be shaken, let us show gratitude, by which we may offer to God an acceptable service with reverence and awe; for our God is a consuming fire. These Thanksgiving Bible Scripture Verses are great for reading before any prayer on thanksgiving day. What better way to praise and show thankfulness to the Lord then through song. The book of Psalms has some great verses that highlight the worship of God through singing. Do you have a favorite thanksgiving song? Life of Praise by Casting Crowns is a great one worship God with. Exalt God for who He is. God has so many amazing attributes that we should focus on Glorifying Him for these. 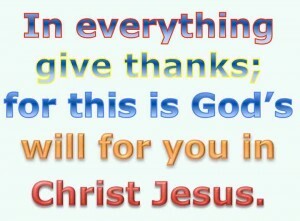 No matter our situation we can be thankful for what God has done for us and for what He promises to do for us. Glorify Him in everything. For What Are You Thankful or What are Your Country’s Traditions? How have you been blessed by the Lord? Or does your country celebrate a special day of Thanksgiving or a harvest festival? We would love to hear about it in the comments below. Thanks Josh, a thankful heart is a joyful heart. Lord make me overflow with gratitude and thanksgiving every hour of the day and night. This site is awsome, it is a blessing to my soul! Thank you Clara, Caroline and Kathy for your encouraging comments! We are blessed to have you as readers at WCWTK. To God be all glory and praise! wow! so much power! am blesssed. I was truly blessed. I’m thankin God for everything he has done in my life and I wanted some scripture, so thank you because I found help here. To God be all the glory indeed! GLORY BE TO GOD FOR YOU, YOU ARE A BLESSING IN BODY OF CHRIST. This morning i got up and my heart was filled with joy. I am thankful that i have been blessed that the Father Amlighty has healed me from past pain and anger. i also give thatnx that i am being used by My Lord daily. Thank you our Lord and Saviour from blessing me. We thank God, for this wonderful site, for our souls have been crying to our God`s mercy that he can answer how prayers, but with the discovery of this blessed site, we are equally blessed. praise the lord. I am so glad that God led you to His powerful word right at the time you needed it. Praise the Lord. amen. we are asking for daily scriptures for we are thirsty and we need daily guidance. send this via the same email address. I want bible quotations for Thanksgiving. Am very thankful to God my Father for directing me here.I love everything good about Jesus Christ,He is my saviuor n Lord. I am so thankful for everything that the good Lord has blessed me with in my life.These verses are so empowering, sometimes i do not know how to be thankful, but after reading these wonderful verses my soul is renewed!! !Praise be to God!!!!!!!!!!!! Hey, GUYS, THANX FOR WONDERFUL WORKS YOUR DOING, MAY THE MIGHT GOD OF HEAVENS AND EARTH RICHLY BLESS YOU. AMAZING page… I will send our little community over here, as well. Hope all will check us out, too, as our Mission is to bring POSITIVE support, encouragment, and uplifting messages daily! I thank the Lord for He lifted me up from the deep mudy clay and He planted my feet on the kings highway and that is the reason I sing and I shout for Jesus came down and he lifted me up! God showed His love for us, by sacrificing His only son so that whoever believes in Him would have eternal life. thanks for all your teaching,you can’t get the next desire before appreciating the first thing you have been blessed with. praise be to the almighty .he is wonderful.i am really enjoying the day courtesy of him. pls i need more thanksgiving quote. this is really inspiring,God has been so mercifull to me and my marriage, He has done great miracles and blessed me alot. iam thankful because i prayed to God for the fruit of the womb and now God has answered my prayer. iam pregnant. Glory be God, i will always praise HIM for His mercies, favour and love towards my life, my husbands life and my family. Thanks for the wonderful life giving scriptures verses. May the almighty God bless you and keep you up in this ministry, encouraging thousands who are in desperate situation. that is a wonderful and touching prayers. God Bless. God bless you Josh, i thank God for this Article. i am a Kenyan and how i came across this its a great blessing. My husband Sumuel my Son David and Caleb were so blessd. i thank God for your wife Karen and your wonderful four kids. May the almighty God continue showering you with his blessings. i and my family we made a decision and this year we want to thank God. God bless! I am searching for suggestions about how you can boost the level of responses on my own weblog, exactly how have you achieve achieving this? I am so grateful for all your work and all the Lord’s words of encouragement that you share on this website. thank you! father i will alway give u thanks for the standard you have taking me to in life isay thank you. father. This helps me with the youth testimonial when i walk up there and tell them things about the bible!!!!! Am so bless by the words you shared here my the Lord continue to inspire you sir. Next post: Is Smoking Cigarettes a Sin?